Patrick Lefevere has decried the influence of television motorbikes on races in the wake of Sunday’s Amstel Gold Race. 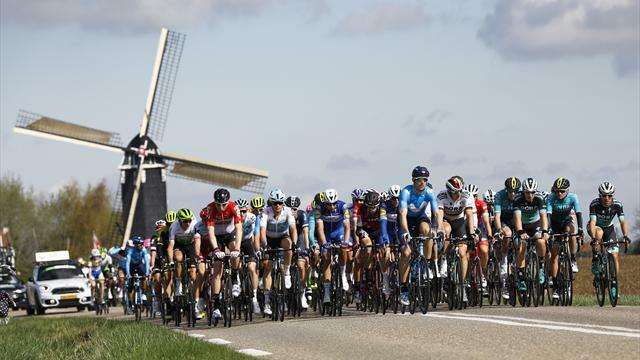 The Quick-Step manager complained that the escapees at Amstel were able to shelter in the slipstream of the motorbikes while his rider Pieter Serry was leading the chase on the front of the group of favourites. Michael Valgren (Astana) won Amstel Gold Race after escaping in the closing kilometres in the company of Roman Kreuziger (Mitchelton-Scott). Quick-Step’s best finisher was Julian Alaphilippe, who was prominent in the finale but had to settle for seventh. “I don’t want to come across as a bad loser, but the role of motorbikes in the race is really scandalous,” Lefevere said, according to La Dernière Heure. “That applies to other races as well as this edition of Amstel. While Pieter Serry was making a maximum effort at the front of the group of favourites, the break was continuing to gain ground because of the slipstream of the motorbikes. Quick-Step Floors dominated the cobbled Classics campaign, winning the Tour of Flanders, E3 Harelbeke, Dwars door Vlaanderen and Scheldeprijs, and they boast a powerful line-up for this week’s Ardennes Classics to boot. Lefevere had no criticism for his charges in the aftermath of Amstel Gold Race. Alaphilippe and Gilbert will lead Quick-Step Floors’ challenge at Wednesday’s Flèche Wallonne, where Alejandro Valverde is seeking a remarkable fifth consecutive victory in the midweek Classic.